Swedish Lapland is located in the northwest part of Sweden. It is a vast area of mountains, broad plains, glaciers, rivers, lakes and forests. Swedish Lapland is Europe’s last wilderness and the land of the Midnight Sun and the Northern Lights. There are lots of activities to do here all year round. Try hiking along the world-famous Kings Trail (Kungsleden), go skiing, river rafting, canoeing, fishing, cycling, climbing, dog sledding and snowmobiling etc.You can also meet the Sami people and learn more about their traditions and culture. 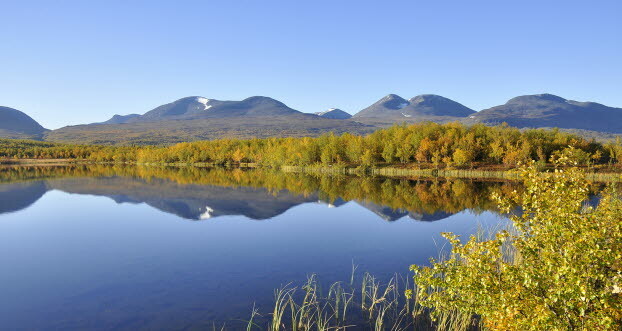 Abisko is a national park in Swedish Lapland where you can enjoy the beautiful nature and rich wildlife. It is a perfect place for hiking and skiing. Why not try the King's Trail which begins in Abisko. In the summer you can hike through canyons and along fjords, make a trip to a roaring waterfall, visit the underworld in one of the many caves, and taste the water in lake Trollsjön - the clearest lake in Sweden. If you go to Abisko in the winter of course you can go skiing but you can also try walking in snowshoes, go dog sledding or ice fishing. One of the best places in the world to see the Northern Lights is the Aurora Sky Station. The Northern Lights shimmers across the sky in different colours, usually pale light pink and green. And since Swedish Lapland is close to the magnetic north you have good chanses to se the magical scene here. The best time to get a glimpse of the Northern Lights is from November to Mars. For those who are afraid of the dark, Swedish Lapland is a paradise in the mid-summer because it never gets truly dark. You can literally play golf in the middle of the night. The Midnight Sun is a period of constant sunlight for 24 hours. The difference between night and day blur and you see everything in a new light. Best time to experience the Midnight Sun is 30th May-14th July. The best way to explore Swedish Lapland is of course by staying right in the heart of nature. Find your campsite here, you can stay in a cottage, tent, caravan or motorhome. Read more about Abisko National Park at www.visitsweden.com.